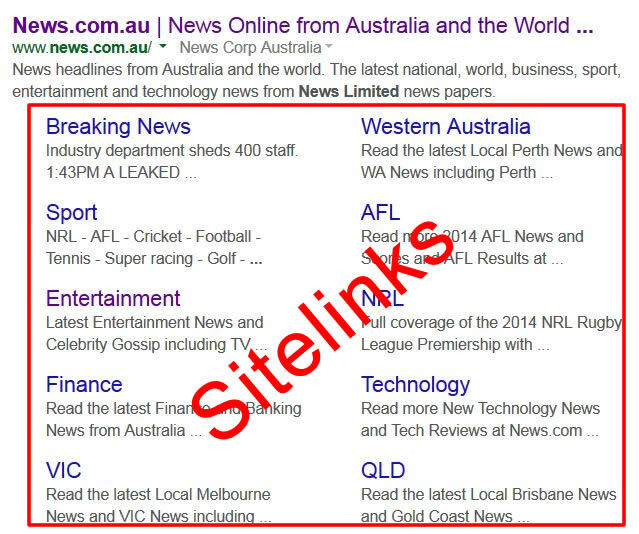 Sitelinks are shortcut links to deep pages in your site. The Sitelinks shown below the main homepage listing use the web pages’ name as the link and the snippet of text below each appears to be powered by each page’s meta Description Tag. You can’t choose which pages to show as Sitelinks – Google automatically chooses which pages to display based on what it determines is the most useful for users (generally the most popular sections of your site or top level navigation pages that match your site structure. Webmasters have control over the removal of Sitelinks from being displayed by ‘demoting’ any pages from appearing. How to remove a Sitelink? 1) On the Webmaster Tools Home page, click the site you want. 2) Under Search Appearance, click Sitelinks. 3) In the For this search result box, complete the URL for which you don’t want a specific Sitelink URL to appear. 4) In the Demote this Sitelink URL box, complete the URL of the Sitelink you want to demote. NOTE – Once you’ve demoted or undemoted a Sitelink, it can take some time for search results to reflect your changes. You can demote up to 100 URLs, and demotions are effective for 90 days from your most recent visit to the Sitelinks page in Webmaster Tools.